With scored attributes, companies can better customize the review process to evaluate their employees on the qualities that the company values the most (on a scale that makes the most sense to them). 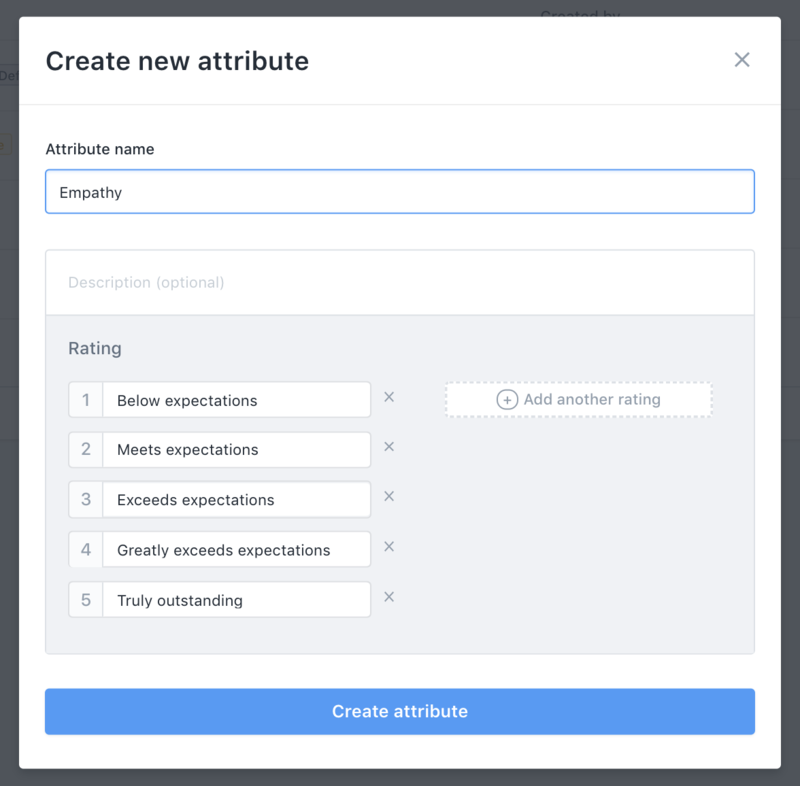 Step 4: Select "Create new attribute"
This will open up a modal where you can choose the name of the attribute, a optional description, and the scale that you want people to respond on. 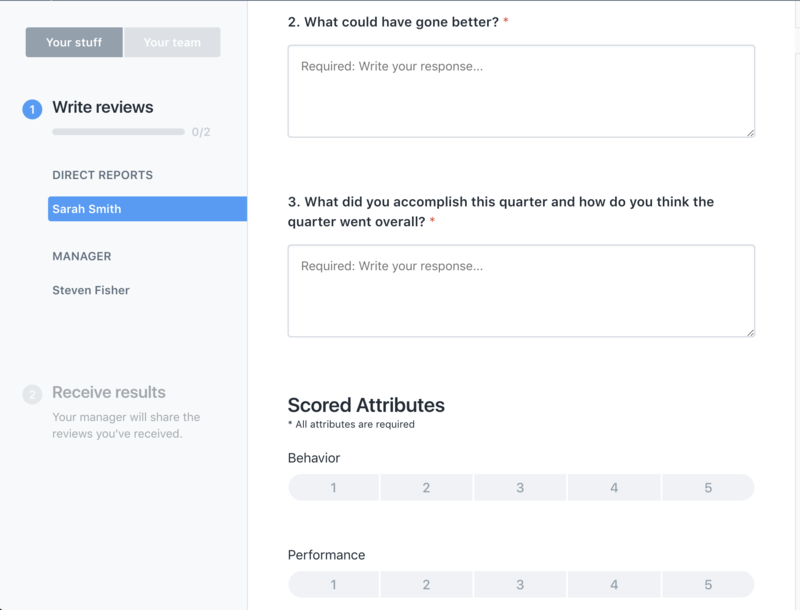 When you're creating a review cycle, under "Scores" you'll find the option to turn on scored attributes. You can enable the setting by toggling the switch on. 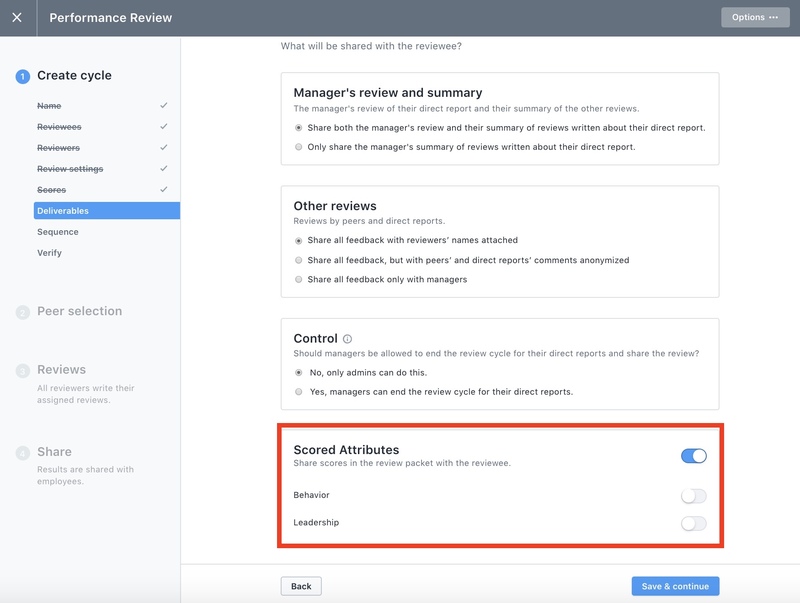 From here, you can assign up to 10 scored attributes that you want managers to evaluate their direct reports on at the end of this review cycle. 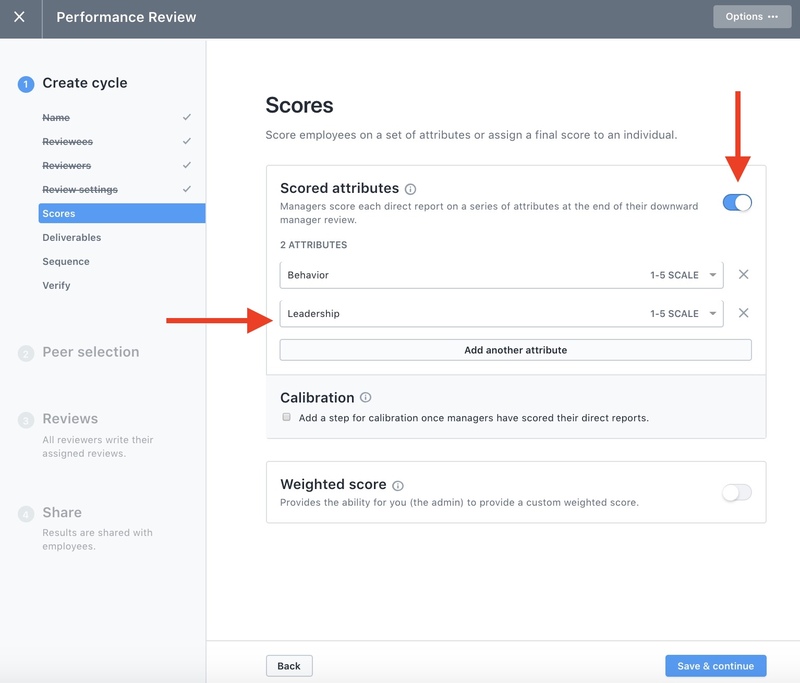 If you would like the scores that managers give to employees to be included in the employee final review packets, turn on the toggle under "Scored Attributes" on the Deliverables section of your review cycle set up. 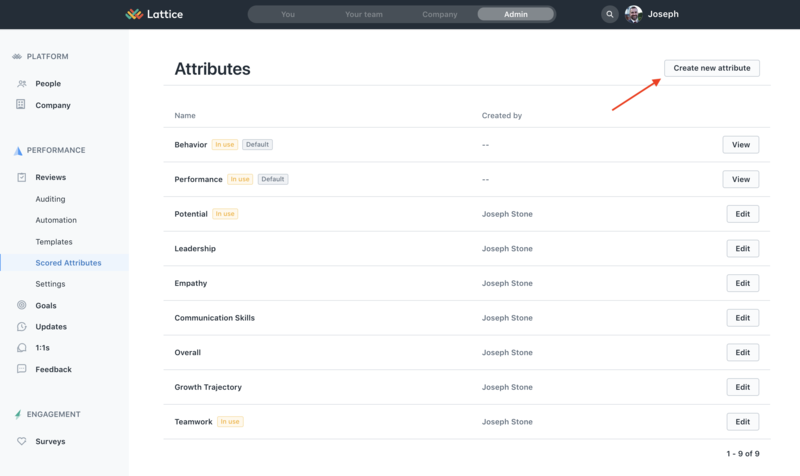 If you choose to share scores, you now have the choice of which scored attributes to include in the employee review packets. Do note that managers will always be able to see all scores, this only let's you select what the recipient sees in their review packet. The scoring takes place at the same time that the manager fills out their review template. The questions will appear at the bottom of the review template. 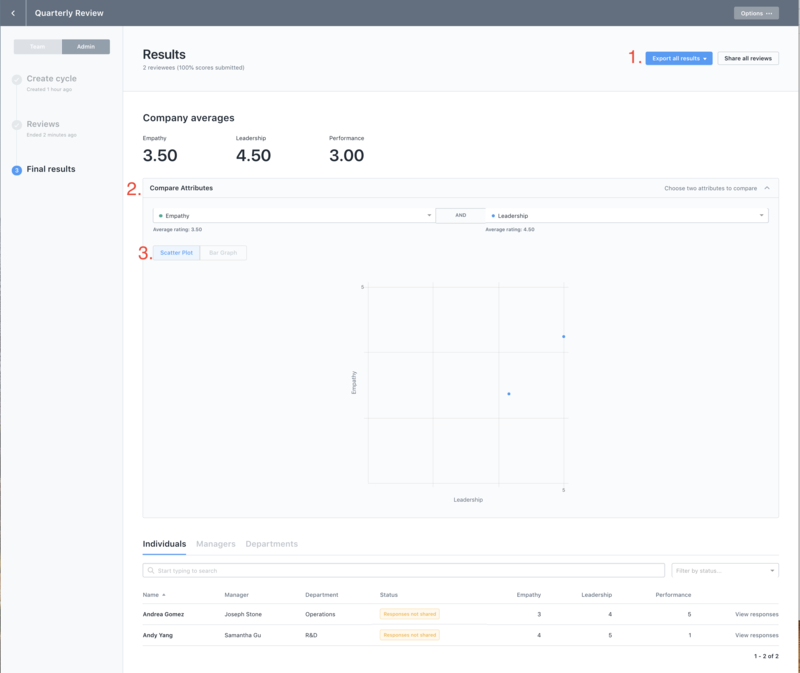 No matter the visibility setting, final scores will never be seen by direct reports, and only admins will be able to view the responses to the scored attributes. 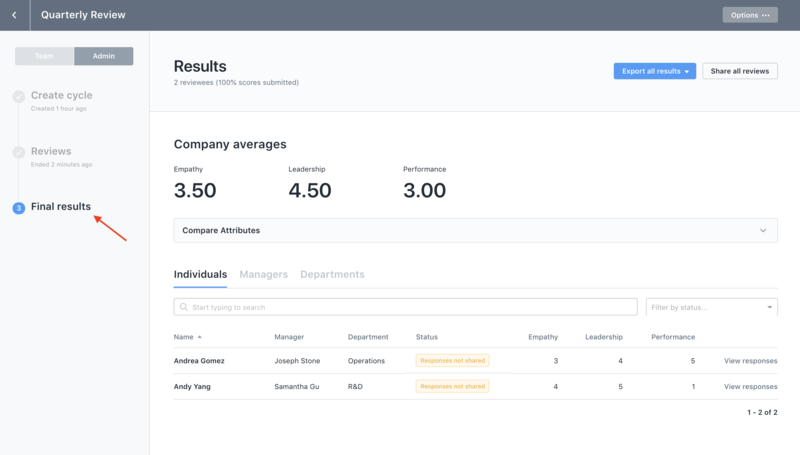 As a manager submitting scores, you will have visibility into if the scores are being shared with the employee or only with the admin. After the review cycle has ended, admins will be able to see the scores submitted for every reviewee in the "Final results" section of the Admin tab. Export the scores to a CSV. Visualize the scores within Lattice in a bar graph or scatter plot. Toggle the attributes that are shown in the graphs through the drop downs if you have chosen more than two attributes. For more on scored attributes reporting, check out this article.